Today was my Birthday. It was a great day and I will not go to bed till midnight. I mean I only turn 42 once in my live. I have the feeling that it will be a great year. I have energy despite the hot weather here in Thailand and looking back over the years I find myself alot more positive then I used to be. I am a person who sees the world with all it’s problems and dangers. Who goes through the world with doubts. I can discern very quickly and assess what can go wrong. But I guess on my journey with God I have found more confidence in myself and trust in God (I would call it faith). Living the life we live here has taught me to worry less and actually believe that God means it well with me, loves me. I am really looking forward whats in store this year on this journey with Jesus. Today I am quite excited. 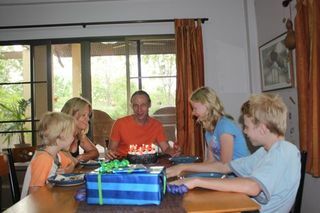 My wife and my three children gave me a great birthday gift today. Something I wanted for years but never wanted to buy. It seemed to unimportant to have. 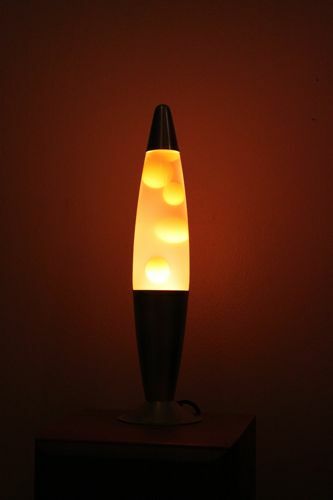 For years I was fascinated by the lava-lamps, I believe came up in the 70’s. I always wanted on even as a child. Now finally I got one and we all love it. It cannot describe why. I think it has a very soothing effect on me and at the same time the liquid movement fascinates me. Lillian took this photo when we we in Pai last week. The note stuck to a little second hand book shop. I had to grin because it is one of those things that on some days makes Thailand very charming and on other days it can drive you into madness. In my urge to define goals, setting deadlines, making appointments and defining the things in my life I realized I lost the freedom of just saying: "closed for ten days". (indefinitely) Perhaps I will be back, sooner or later I will for sure because those things are kind of important. But sometimes I need to live in the moment without giving an explanation; just perhaps a note that says that I am gone. Walking with Jesus requires faith. I mean how can you have a relationship with God you cannot see and trust Him with your life, making decisions based on what you believe is His will. In my walk with Jesus not seldom I have made steps believing to have understood only realizing in my immature faith I have made another mistake, a miss-step. Over the years I have become aware that faith is walking with Jesus on a daily basis. I don’t mean a daily fulfillment of religious obligation, but a loving dependency towards God. He gave me life and knew what this was all about. I am going through life curious to find out about this mystery. While walking with Jesus I have to take risks to grow. I have to let go of my own sense of security and embrace the the call coming from him. Sometimes blindly and on shaky ground. Often against what many people think. I get confronted alot with different sets of values of how I should live my life. Not getting the satisfaction of being accepted. Being judged for my values is not a nice thing in the least. Still while being on this journey long enough many things become clear and also familiar, perhaps easier in some ways. At least till the next bend where I have to take all my courage together to walk on into the unknown. 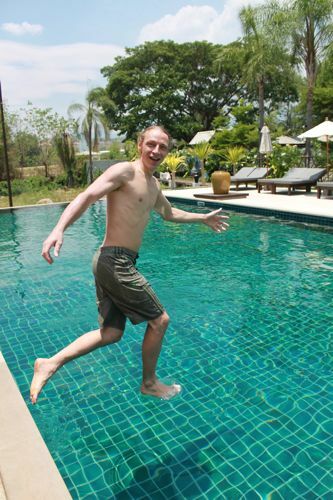 Sometimes walking on water seems to be the easier thing to do then embarking on a lifelong journey with Jesus. Even though I cannot really judge that, because I have not succeeded in either one yet. So I will keep on walking. Be it on water or the life ahead. Some years ago a started changing my diet. I am not religious about what to eat and what not. I am also not opinionated when it comes to food. Except maybe about chocolate. No other chocolate really compares with Swiss chocolate this is just a fact I discovered early in my live. Being Swiss probably helped in the forming of this particular opinion. But going back to my change of diet. I didn't need to loose weight. To be honest I could do with a few more kilos. But I accumulated some bad habits. At breakfast I would eat Frosties (loaded with sugar, not much fiber) and toast bread (more or less paper with bread taste 🙂 This with other bad eating habits left me with low energy. Then I discovered Müesli again. I don't know if there is another name for it. It seems to me that this is the only internationally known Swiss-German word. Nobody of course knows what it actually means. People know though that it is some healthy cereal. "Muesli (pronounced /ˈmjuːzli/ or /ˈmuːzli/) is a popular breakfast cereal based on uncooked rolled oats, fruit and nuts. It was developed around 1900 by Swiss physician Maximilian Bircher-Benner for patients in his hospital. It is available as a packageddry form, or it can be made fresh." For those who really want to get into it 🙂 Here is a link to Wikipedia. Here in Thailand, Müesli is very expensive. So I started making my own version, buying the ingredients and mixing it in a big salad bowl. I am not a big writer. I realize this when I have to write reports, newsletters and update my web-page. I really need to be in a creative mood and I need lots of time and some sort of pressure to complete. I haven't been on my blog for ages and haven't updated my questasia site which really needs updating 🙁 So I need coaching (Lillian do you read this?) I guess I need some sort of foolproof system to get going with this. On that note I will go back to facebook and see what all my "friends" (or the would be ones if I ever meet them again) are doing.